Any plan for aging homeowners that want to maintain their independence and current lifestyle needs to keep comfort, mobility, and safety in mind. One major component for making that happen is taking stairs out of the equation. Keeping everything on one level helps reduce the risk of tripping and falling. That’s why single-level living plans are an ideal starting point for homes suited for aging in place. Of course, there is more to aging in place than just eliminating stairs. Let's take a quick look at three different floor plans that are ideal for aging-in-place. We'll examine some of the features (in addition to single-level living) that make them a good fit. The first plan we’ll look at is our Devon Ranch—a 1,648 square foot rancher that you can find at our new Magnolia Ridge development in Middletown— conveniently located only minutes away from Interstate 91 and CT Route 9. For a more detailed look at this plan, click here. While everything is on one level, there’s more to this plan that makes it a great choice for aging in place. The open floor plan makes it easy to move from the spacious kitchen to the dining area and into the great room (your most-used rooms) without having to negotiate hallways. The laundry room is on the same level—and even the entrance to the home from the 2-car attached garage is on the same level. And if you want to go outside, the covered front porch and the back deck are also on the same level. There is plenty of space—but it’s all easy to access and maintain. And it features two additional bedrooms that can serve as guest rooms, a home office, or even a craft room. The second plan (also featured in the Magnolia Ridge location in Middletown) is the Emerson Ranch. Click here for a more detailed view of this plan. 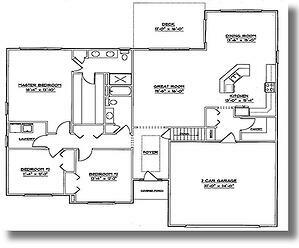 This plan provides a bit more space (1,903 square feet) and features an additional “flex” room. It also offers everything you’ll need on one level. 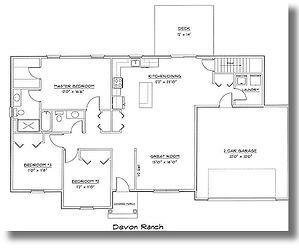 One additional difference is that the laundry room in this plan is located closer to the bedrooms. That can make things easier since the majority of laundry comes (and needs to go back into) the bedrooms. This plan also uses an open style design that makes it easier for homeowners and their guest to move from one common area to another. The third plan is our Rosewood model (click here for a larger view of the plan). This spacious plan (2,100 square feet) features 3 bedrooms and two baths. The kitchen has an island (great for meal prep and casual entertaining). A real plus is a walk-in pantry that makes it easy to get at the things you want (while keeping clutter out of sight). 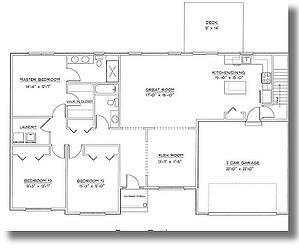 The open design in this plan is a little different in that it has the kitchen adjacent to both the dining room and the great room. But it still provides great visibility and easy access. The laundry room is conveniently located near the bedrooms. As important as a good basic plan is, it’s just the beginning. When you’re considering aging-in-place in your new home, there are other details you’ll want to pay attention to. Bathrooms and kitchens tend to get the lion’s share of attention when homeowners think about creating a home that will allow them to age in place. That's understandable, and you'll want to give serious thought to features such as "curbless" showers, bench seating in your shower, grab bars, and hand-held shower heads. It’s smart, however, to think about other important areas of your home—including your bedroom. Here’s a post that covers a number of fairly simple changes that can make your bedroom safer and more comfortable. What else should you think about when creating a home that will meet your changing needs as you age? The National Association of Home Builders (NAHB) has given some serious thought to this. Click here to download the NAHB Aging-In-Place Remodeling Checklist. Even though it’s geared toward remodeling, the ideas apply to features you might want to consider when building a brand new home as well. Everything begins with the basic plan, however. So make sure the plan you start with will meet your needs now—and several years down the road so that you can enjoy life in your own home as long as you want.